A piece and a package of Stride Sour Patch Kids raspberry chewing gum. A new format for an old, time-tested flavour. Whether you appreciate or loathe Stride’s new Sour Patch Kids raspberry chewing gum will depend less on the flavour and more on what you expect from a piece of gum. Should it freshen your breath and make you feel all cool and minty inside? Or should it be a chewable little low-calorie treat to add a touch of flavour to your life between meals? This gum falls firmly in the latter category, milking childhood memories of Sour Patch candies – the kind plucked one-by-one with plastic tongs at the local 7-Eleven – to sell a chewing gum that’s less embarrassing than the grape Bubblicious favoured by teenaged babysitters in the 1980s, but more fun than stodgy old peppermint Trident. 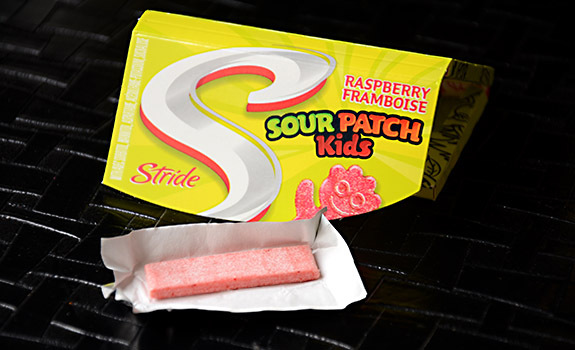 The Look: Combines the Stride logo and the Sour Patch Kids logo, with a smiling little red sugar-dotted candy “kid” on the packaging to emphasize the connection. The fold-out packaging and gum format will be familiar to anyone who knows Stride gums. The Taste: A sniff reveals an unfortunate soupçon of nail polish in the bouquet. Once popped in the mouth, the quick but subdued burst of raspberry Sour Patch flavour is immediate, followed by the cloying artificial sweetener taste of Crystal Light. Compared side by side with real Sour Patch Kids candy, the flavour is actually quite accurate (artificial sweetener notwithstanding), though it’s nowhere near as intense. And that’s probably a good thing. While the majority of the flavour vanishes quickly, the gum continues to hold together for much longer, releasing a hint of the original flavour one chew at a time. Cost: $3.99 for a three-pack at London Drugs. Availability: Widespread in Calgary. Lime flavour also available. Nutrition? : Per 1 piece (1.9 grams): 4 calories. The verdict: Bottom line, if I want a pack of raspberry flavoured gum, this stuff is entirely OK. It’s not going to be an everyday gum, as going into a meeting with minty fresh breath is fine, but going into a meeting smelling of gloriously artificial raspberries is, sadly, frowned upon. But it’s a nice pick-me-up that unabashedly trades on nostalgia.